CURT & SHONDA SCHILLING - CO-FOUNDERS "CURT'S PITCH FOR ALS"
Reading Waking Up opened up so many of my emotions. Most of which every single one of us experience at least once in our lives. Happiness, pain, loneliness, and heartbreak, to betrayal. These things happen in so many different ways and almost always in varying degrees. This story is about a woman who faced all of these emotions on a daily basis in a way that we can only imagine. No person should have to experience this much in a lifetime. To have done this before the age of 35 is just heartbreaking to imagine. 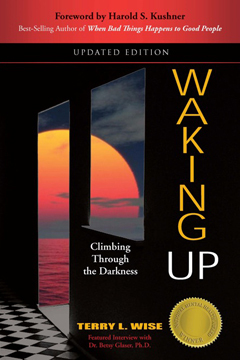 Waking Up takes you on a journey into life’s pitfalls, the ups and downs of one woman who in one lonely night chose to throw in the towel on life. Someone had a different plan for her and that night did not end her life, but instead, put her on a path to a new beginning. This story shows you how much we need others to help us make sense of the paths that our lives take. Her choices give insight and hope to those who think life has nothing to offer and a faith and belief that if she can do it, and has done it, then so can we. The insight gained through her conversations with her therapist are lessons to all of us¾that the only true way to happiness is in the ability to open yourself up, be seen by others and listen to viewpoints on things you think would be better left unsaid. It becomes obvious that having someone ask and answer questions you want to ask, questions you need answers to, can shed light into dark paths from which we all have to make choices. I hope you enjoy this book as much as I did, and in the end I truly hope you see what is important in our lives and how truly important our lives are to other people.